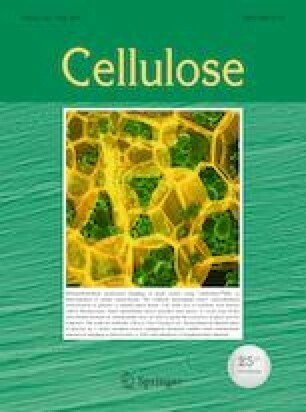 Nanofibrillated cellulose (NFC) and polyvinyl alcohol (PVA) were alternately deposited on a NFC/polyethylene terephthalate (PET) substrate by the use of layer-by-layer (LBL) self-assembly technique. The results reveal that by adding a single PVA layer on the NFC/PET substrate, the surface exhibited more hydrophilic properties showing reduced contact area and excellent surface wettability. Furthermore, the common FT-IR band for a carboxylic group was observed at 1535 cm−1, which indicates that NFC treated by TEMPO oxidation was attached to the surface layer of cellulose mats. Moreover, the 10 layer LBL assembly of the NFC and PVA were spread out into a reticulate structure during the drying process, resulting in a much rougher surface than that of 1 LBL assemble on the NFC/PET film. Finally, the thermal stability of the multilayer films had been significantly improved. This work was supported by National Natural Science Foundation of China (31470608) and the fundamental Research Funds for the Central Universities (201522117).